6 Best Thanksgiving Wines for Your Awkward Feast - FiliVino! AHHH! Thanksgiving is here, and that means family. Lots of family. And if popular sitcoms and other com and dram-related media would have is believe, that means family drama. Whether it’s fueled by, or tamped down by wine is up for debate. 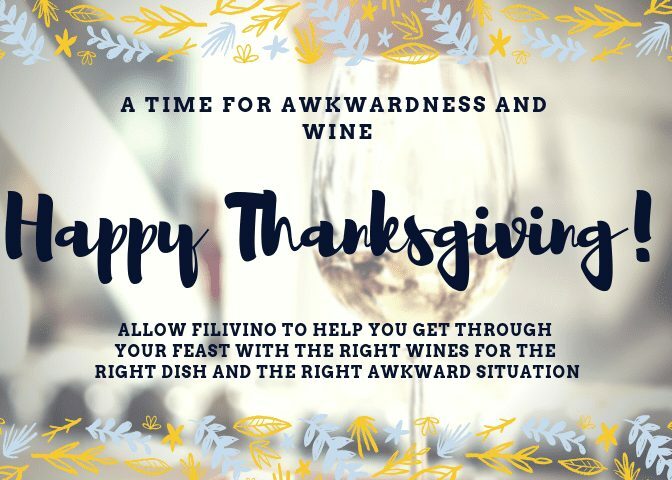 So whether you’re looking to unwind after some bizarre tirade your mother in law makes against your sister-in-law, or whether you just want something to sip on while you watch the fireworks, you need something… Oh, and I guess having wines paired with traditional Thanksgiving foods would be good, too. One of my very favorites to pair with some dry turkey is a nice, fruity beaujolais. The soft red color along with the fruity tartness will do well to offset the heavy gaminess of any holiday turkey. This wine works especially well if you’ve forgotten the cranberry sauce since it hits some similar notes. Ok, I first bought this as a sort of joke. Who can remember the days of the whimsical hobo? Back when being homeless and riding trains was romanticized. Or even when, apparently being homeless and wearing clown make up was celebrated in statuette form (bonus points for playing a trumpet). But alas, it was actually quite good! Not only that, but it has a fruity, while peppery tone to offset the salty ham on the table. Or maybe you just want something to pair with Thanksgiving side dishes? If you’re staying away from the traditional main-meats on the table, or looking to carbo-load with the stuffing, or maybe even if you’re having something herby, you’re going to need a white wine to pair along with it. Sauvignon Blanc is going to help cut some of those herby tones and keep them from building up on your palette so that you can still eat something else afterwards. And if you’re finding yourself hunkered over the cranberry sauce/jelly like some sort of weirdo I even have something for you. Tempranillo is both fruity and oaky. So not only is the sweet fruitiness going to run alongside the tart cranberries, but the oak is going to help cut through all that while you ready yourself for the most important part of the meal. Whether you’re having actual desserts, like Sticky Toffee Pudding , Cheese Tarts, or Lemon Bars, or just having liquid dessert, this wine is going to be a perfect palate- cleanser after a rich, heavy meal. With bright, sweet tones, you’re going to nod off to sweet tryptophan laden dreams while your favorite football club gets knocked around on TV. This could come at any part of the day, so you have to be ready! And what, pray tell should you have on hand to get you through this? Probably Boone’s Farm. Pour all the leftovers from the wines above into the biggest bowl you have and insert face.